The story is a truncated muddled disaster, but key elements are intact for better films to come if Ka wills it, but let's not get our hopes up. Made for 'Dark Tower' junkies/apologists only. Rated PG-13 for thematic material including sequences of gun violence and action. My first trip to the top of Stephen King’s Dark Tower series was unsuccessful. After plowing my way through the first four books, I hit a roadblock when I reached the fifth. I considered it unreadable and stopped, dead in my tracks. Cut to a few years later and the Tower kept calling me back. I wanted to finish the series and decided that maybe the best way to do it would be to embark on a quest of my own. After weeks of research I put together a pretty definitive reading list, putting them in order by how they’re connected, and started from scratch. (The reading order will be listed below for interested parties.) Taking just over a year to complete, I made my way through and came out the other side of the door, say thankya. So with the film finally on its way after 10 years in development hell, I knew it was time to hit the road with my favorite literary ka-tet and try to make another run through before it came out. While I may only have made it 70 percent through Wolves of the Calla, The Dark Tower screening has come and gone. I have seen the film and while it’s far from perfect, it’s still another turn of the wheel. For those who feel the most burned, it comes down to this: the film in their head was way better than what co-writer/director Nikolaj Arcel finally delivered. And while it may come with King’s own blessing, along with Robin Furth’s (Stephen King research assistant, Dark Tower Concordance author, DT comic book writer), there’s no denying that this Dark Tower may be an empty shell of an epic eight book series. There’s plenty of fun to be had for those willing to chuck khef out the window and just be thankful that we ever got anything at all. 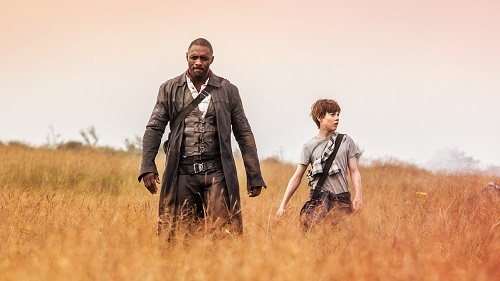 While the film may never have lived up to expectations, the best thing to do is just skip the first four steps of the grieving process and come to accept that this is the cinematic Dark Tower. We still have the books at our disposal. While it may not be new and improved, if Star Trek can have an alternate universe, then so can The Dark Tower. The whole series runs on the existence of multiverses and this movie just exists on a different level of the tower — which is the whole point to begin with. It was always said to be a “sequel” to the books. Even though this may be the loosest use of the word — Roland (Idris Elba) being in possession of the Horn of Eld as the only clue — therein lies the film’s biggest flaw. There are only one or two lines of dialogue that even remotely reference the books. One is better than the other, while the other is a huge spoiler for anyone who may not get through the books before the movie comes out. For the rest of us, we’re left scratching our heads as to how a complete reboot can be considered a sequel. t Then there’s the issue with Arcel — and co-writers Jeff Pinkner, Anders Thomas Jensen, and somehow-Oscar winner Akiva Goldsman — cramming in as many references to other King films rather than focusing on what makes the series work: character. Thank Ka we got Elba cast as Roland. The man is our beloved Gunslinger, he’s just stuck in a really bad reimagining. If there happens to be more films — we’ll see what happens with the TV series, which is supposedly going to be a straight adaptation of the fourth book, Wizard and Glass — Sony Pictures has some serious making up to do. Aside from the film’s many, many issues, Matthew McConaughey is surprisingly being one of the biggest flaws. He always looks bored, completely sleepwalking his way through a literary icon and it shows that he only spent a few days in the role. (Confirmed by Elba on Jimmy Fallon.) The last scene of the film is one of the most obviously tacked on studio-meddling sequences in recent memory. There’s no way studio interference didn’t bring this one about. It’s abominable. Let’s just say that with how meta the books get, I’ve got a great idea to make the next movie even more so. Call me! As it stands, The Dark Tower seemed to have three camps walking out. 1) Those who love the core books and are more casual King readers loathed the film with every ounce of their being. 2) Those who have never read a single book who seemed to enjoy it for what it is. 3) Those who may be a little in over our heads when it comes to The Dark Tower who feel complacent. That’s really the only word for it. The saddest part is they cater so much to fans while dumbing it down for everyone else that it turns the whole movie into a giant muddled mess. Even my wife — currently finishing up Wizard and Glass — was thoroughly confused. They spend so much time simplifying the story and even more time on exposition. It doesn’t help that the plot is culled from multiple books, some even from outside the core. For anyone who wants more information as to why the Breakers are so important, read Black House immediately! Long story short, there was no way The Dark Tower was ever going to live up to anyone’s expectations. It’s nothing short of a miracle that the film exists at all. Arcel does the best he can in trying to wrangle in an entire multiverse of storytelling. Could it have been better if he was given free reign to make a straight adaptation? Absolutely! But it could have been far worse. Early versions of the script were way worse from early reports so it’s a testament to Arcel for getting anything up on the big screen. Let alone something that so dearly loves King and all his works. For those willing to go along for the ride, most of the gang’s all here. Sombra, Taheen, Manni, oh my! Even the opening production logos features one for the Tet Corporation. Now that I think about it, maybe that should be the first clue for what you’re getting into. Maybe this is their version of the books? It certainly puts an even more meta spin on things. Considering how lazy some of the movie is, that’s giving it too much credit. However, if they would like to take credit, I’m happy to provide a mailing address for a royalty check. The Dark Tower was always bound to piss most people off. After 40 years, there’s no denying the power of the beams was too powerful to make something palatable to modern audiences while appeasing the rest of us. On the flip side, considering we live in a time where we have three Lord of the Rings/Hobbit films, Harry Potter, and Game of Thrones, it only shows how much more room there was for Arcel to get it right. As it stands, a Dark Tower film finally exists and that is the truth.